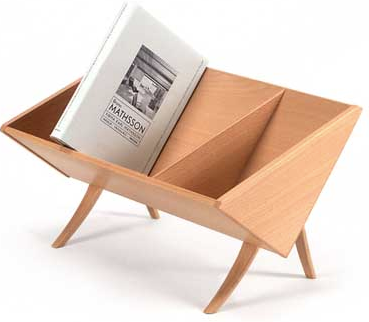 Heywood's product was inspired by the Bruno Mathsson Book Crib, which is still being made. Want something with a less modern look? 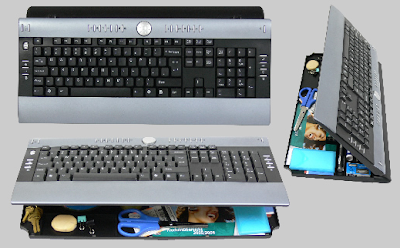 Head over to Old Ways Limited and take a look at its DeskRack. Old Ways also has this style of BookRack, which expands from 17 to 34 inches, in three different end panel designs. 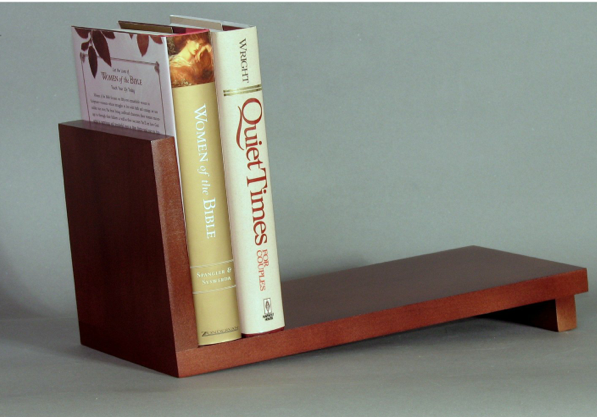 If you need something a bit less bulky, for a smaller space, you could use something like the Slant Book Shelf from Woodform, sold via Amazon.com. 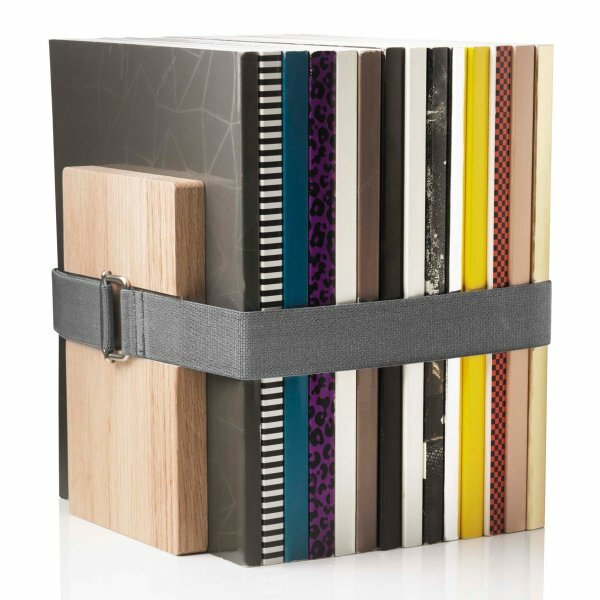 And finally, for a very different approach, there's the Book Binder. 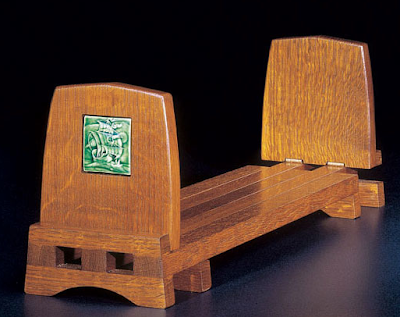 I'll just quote from the Design3000 web site to describe this one: "Two end pieces of lacquered wood or raw oak are fastened with an elastic band. 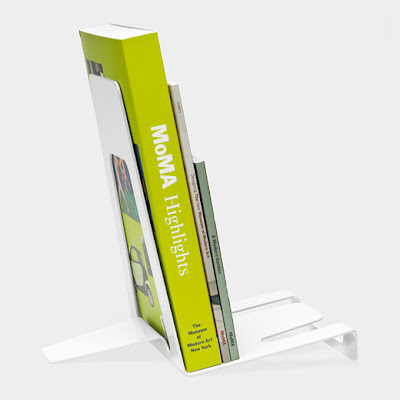 So books or magazines can stand freely wherever your please. The elastic band also provides flexibility, allowing you to easily add or remove a book." 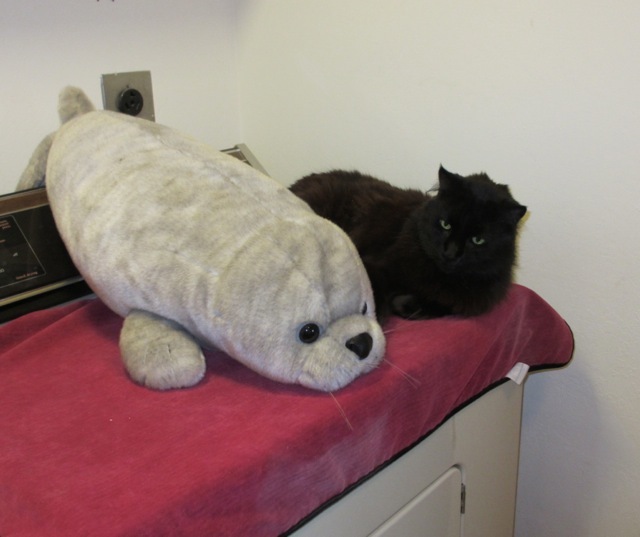 My mom's beloved stuffed baby seal — one of my gifts to her, and one of the few possessions of hers that I kept after her death. Someone you love dies, and you grieve. And somewhere amidst the overpowering grief, the question arises: What am I going to do with all of the person's stuff? 1. If at all feasible, take your time in going through your loved one's possessions. Don't get rid of things before you're ready to. 2. When you are ready, consider keeping a small number of very special things. Lisa Montanaro is a professional organizer who, sadly, has had to grapple with this recently — and has written a thoughtful piece about it. Here's a bit of what Lisa wrote about organizing after the loss of a loved one — and I encourage you to go read the whole thing. It's not long. I often tell my clients to choose items that embody the person’s spirit, remind you of details of his or her personality, or that carry special memories. 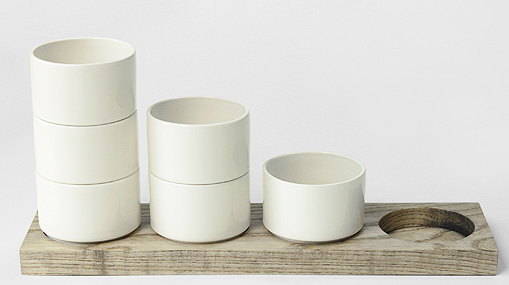 There is no magic number of how many items to keep, but remember that sometimes less is more. Over time, you will be able to let go of more. Don't be frustrated by not being able to let go of certain worthless objects — I just now got rid of an old mirror from the 60s that was on my grandmother's door. She died three years ago. I was ready at certain times to say goodbye to certain things. You need to move at a pace that is right for you. Don’t feel pressured to part with things if you’re not ready. Find the handful of his things that you value most and that best honor your memories of him. 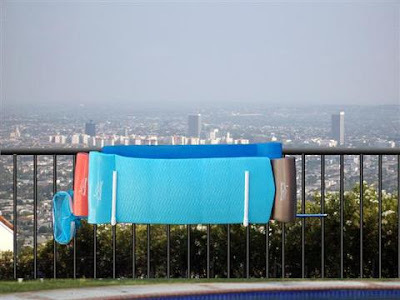 You will instantly recognize these special items when you see them. 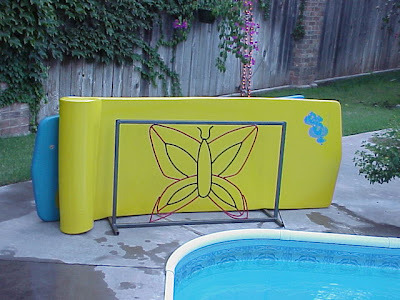 ... Find a way to honor the treasured items you decided to keep. 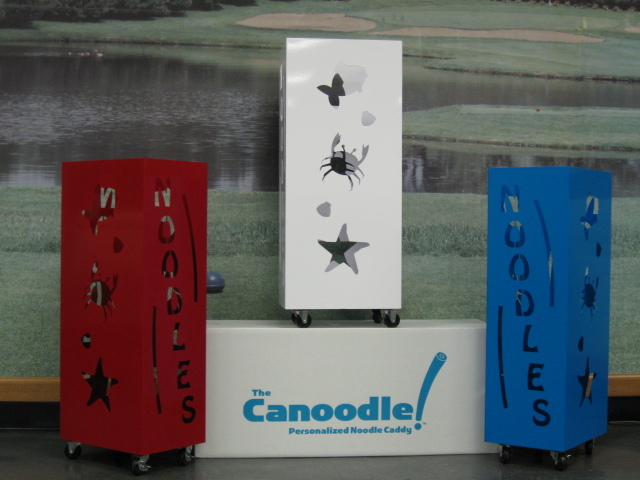 Frame and/or display these things so you can enjoy them. Let these wonderful objects continue to bring you happiness. 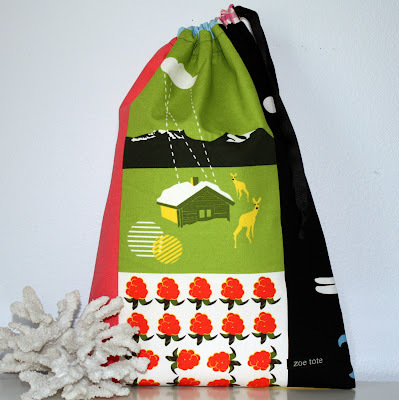 Want a lovely laundry bag instead of a run-of-the-mill one? These bags are one place where you can splurge on your organizing products and still not spend a fortune. 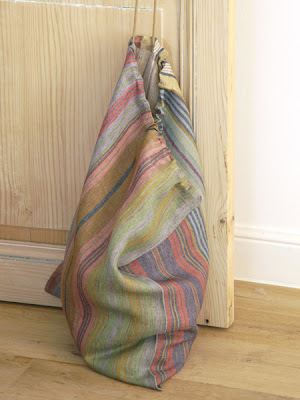 Let's start with a look at Ivy Halls, which has some of the most striking laundry bags I've seen. 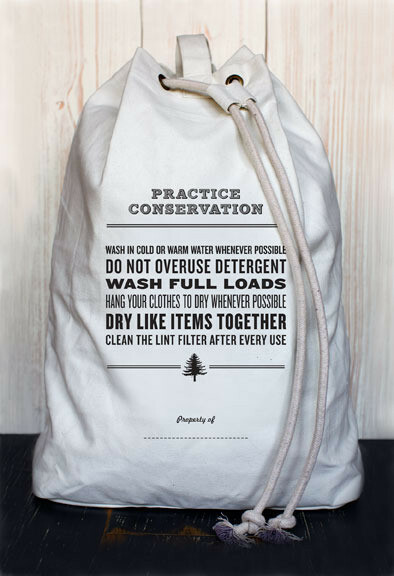 Izola (in the U.S.) and Evergreen Wrap (in the U.K.) have four laundry bags that are both fun and elegant. Picking Poppys has some colorful laundry bags. 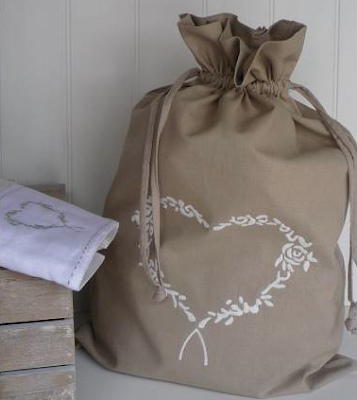 This linen laundry bag with the heart is available from Marquis & Dawe and from Bliss and Bloom. The 100% linen Georgetown laundry sac from Libeco is one of the more expensive choices, but it sure is lovely. Zoe tote only has this one laundry bag, but it's pretty spectacular. 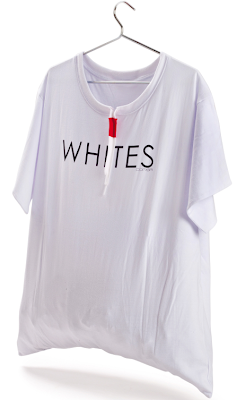 And finally, I'm delighted with the T-shirt shaped laundry bags from Comsa; there's this one for whites, and a red one for colors. You can get the white one from PA-Design, and both the white one and the red one from Monkey Business and Animi Causa. The Super Noodle House from FloatStorage is made from mesh and PVC. The same company sells a couple other upright noodle organizers, too. Or you could hang your pool noodles from a Noodle Rack, also from FloatStorage. More concerned about rafts than noodles? 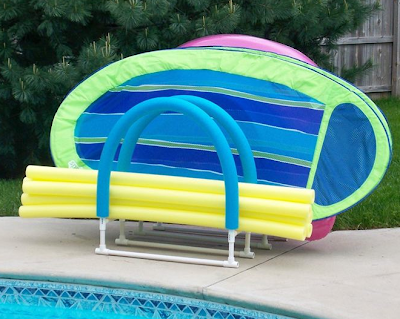 Take a look at the Simply Better Pool Raft Holder, made of "furniture grade PVC." 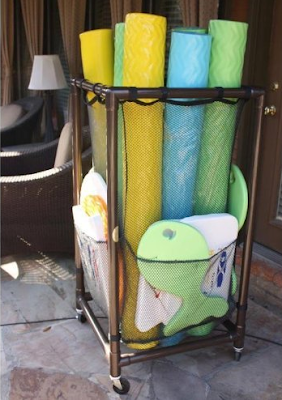 Improvements has a raft caddy, too. 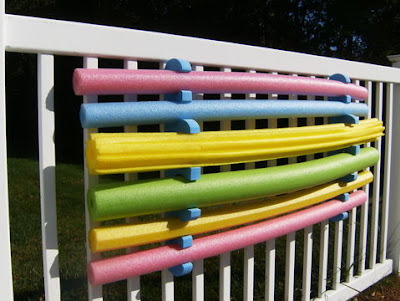 If you want to avoid PVC, you could get a float rack from Fun Metal Creations. Update on May 4, 2018: I'm no longer finding this product. 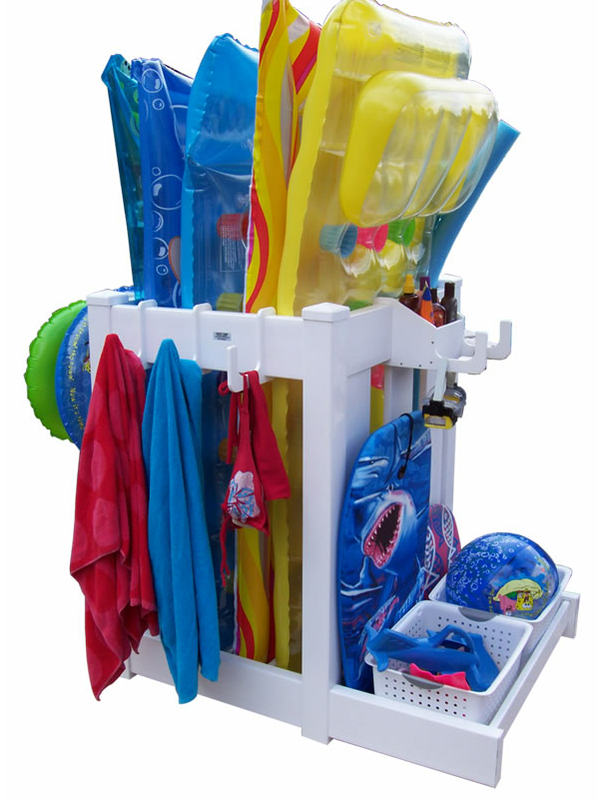 You could also get a hanging float rack from FloatStorage. 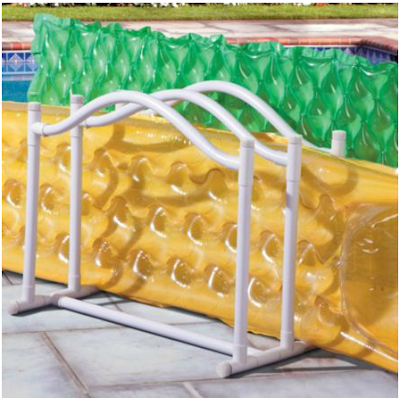 And then there are the multipurpose pool organizers. 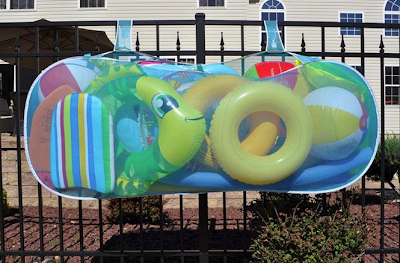 One of them is the Pool Blaster Pool Pouch, from Water Tech. One place to buy it is Brookstone. And here's a Poolside Organizer from Hott Sun; the baskets shown are not included. Warning: The web site plays snippets of music at you, and makes sounds when you go from page to page; there's no silence button. If you want to store things on your desktop in an organized manner, and you're looking to buy some cool products for that purpose, you can go one of two ways. 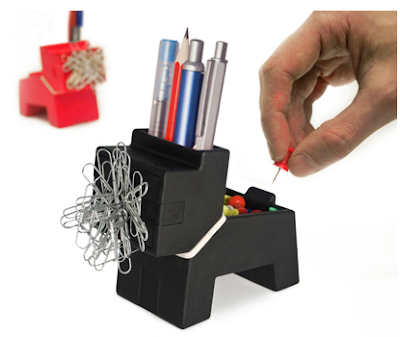 You can get paper clip holders, pencil cups, etc. 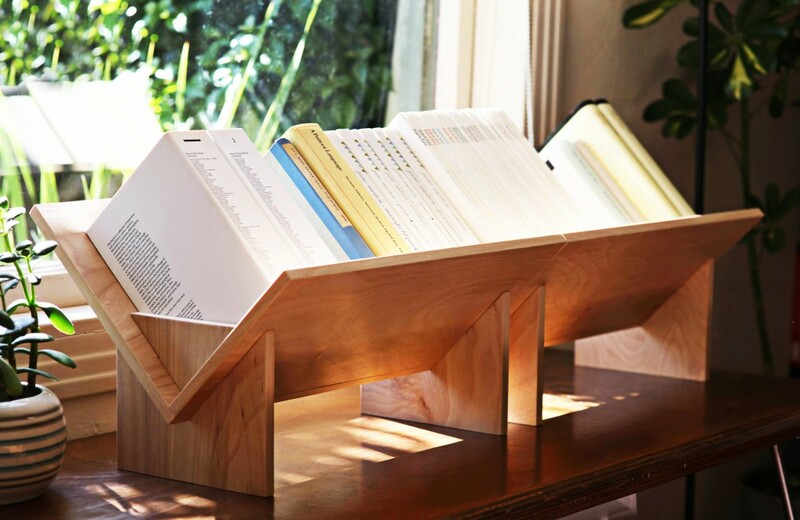 — or you can get an all-in-one desk organizer, also known as a desk tidy. 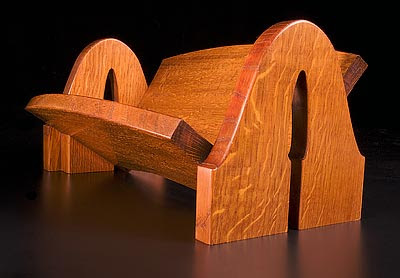 Some of the coolest desk tidies come from Vacavaliente — specifically, from its Amigos product line. 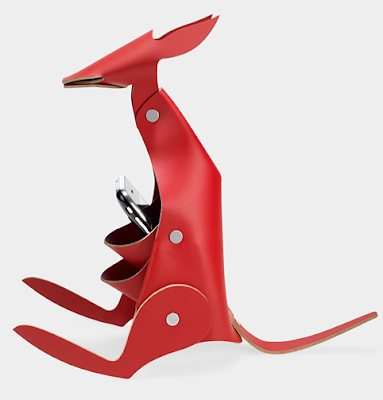 I've mentioned the dog-shaped desktop organizer before, but there's also a kangaroo, a horse, a cat, and more. Some of the places you can find these are the MoMA store kangaroo, AHA life (kangaroo and horse) and Hip Urban Green (dog) in the U.S. — and Zany in New Zealand (cat, kangaroo, dog). As the MoMA site explains, they are made from "100% reconstituted leather, an environmentally friendly material composed of recycled leather." For a different take on the animal theme, there's the Rocky Desk Butler from J-me. And here's another wooden desktop organizer; this one comes from WoodMarvels.com and can also be bought through Ponoko, in two sizes (5 cm high and 8 cm high). These do require some assembly at home — but the Ponoko site assure us that "all that is needed for assembly is some carpenters glue and a few hours to allow everything to dry together." Troika makes the Office Trucker and the Office Express. These are mostly intended to be promotional items, with your company's name imprinted on them. 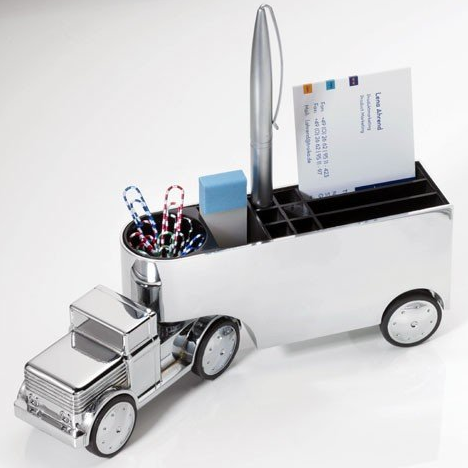 But you can find a few places selling individual pieces with no personalization — including Amazon.com, which has the Office Trucker. 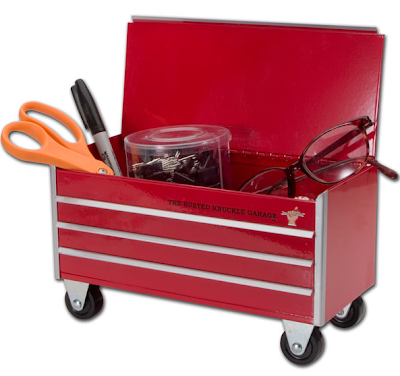 And finally, here's the Miniature Desktop Toolbox from Busted Knuckle Garage, made from "heavy duty .24 gauge steel" and "powder-coated in toolbox red." Anyone have a favorite among all of these? I'm always curious as to which products hit other people's fancy. I read a lot of blogs, even after doing some major unsubscribing. I glance at about 400 blog posts a day — just the titles and maybe the first lines, which is what shows in my RSS feed in Google Reader — and decide to take a closer look at maybe 50 per day. When I first look through the posts, I just "star" the ones I want to look at, and then go back to them later. But somewhere along the line the backlog of starred items got out of hand, and I found myself with 635 starred items. Not good. I didn't want to declare Google Reader bankruptcy and just dump all those blog posts without a glance — so I did what organizers recommend to others, and went through my backlog a bit every day for a week, until I was done. Small dedicated blocks of time do add up, and the steadily decreasing backlog number was encouraging. The clutter of those unread blog posts represented, as clutter often does, a series of unmade decisions. What were all these blog posts, and what did I want to do about them? 1. Blog posts triggering some action. Sometimes that was a quick-and-easy action, like mailing a link to the post to someone else I thought might enjoy it. Sometimes the blog post had an image I'd like to include in one of my own blog posts, and I needed to ask permission to use it. I've got a standard query for that, so it's easy to send off the message. I did these quick actions right away. And sometimes the action was commenting on the blog post, and that's pretty quick, too. 2. 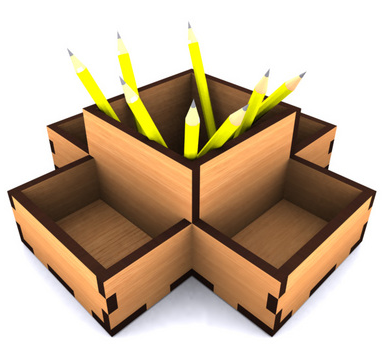 Blog posts providing organizing-related reference information. These posts might be about products my clients might care about, or products/strategies I might want to blog about — or both. In that case, I'd just add the blog posts to my bookmark collection, and perhaps add an item to my "future blog posts" list. Some posts that seemed to be useful at first glance were less so when I looked more closely; for example, the products might be only at the concept phase, or very hard to get your hands on. Those I didn't include in my bookmarks. 3. 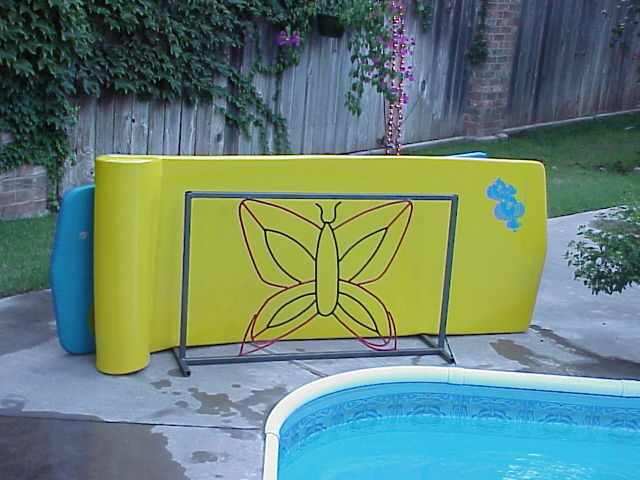 Blog posts providing other reference information. 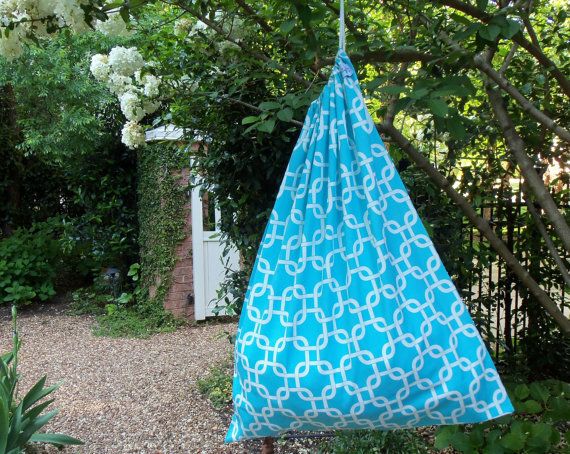 Here's just one example: a blog post mentioned a product I might be interested in buying. In this case, I added a bookmark to my "Possible Purchases" bookmark folder. (The vast majority of the items in this folder never do get bought, but it's still proven helpful many times.) Other examples might be recipes I'm interested in trying, or local places I want to visit. 4. Blog posts providing juicy content: long articles I wanted to read, or videos I wanted to watch. These could get added to a reading/watching list — but what I did as part of the clean-up was decide to read or watch them now. That sometimes meant curling up with my iPad rather than sitting at my computer, but I wanted these things OUT of my backlog. 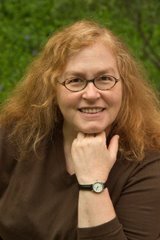 So, because education is one of my interests, I read about why someone chose to spend $140,000 to send her child to a Waldorf school for 12 years. I also watched a wonderful almost-five-minute video explaining why Pluto is no longer a planet. But I also found that some things I thought I'd want to read or watch didn't grab my attention when I took a second look, so I just removed the star from those, with no regrets. And yes, my prior blog post did make me a bit fussier about which items I wanted to give my time to. Now, after a week, I'm down to a single starred post (and no unread posts) — and that one starred post is there on purpose, as a reminder to show my gratitude to others. It feels pretty darn wonderful to have that backlog gone. Want some time management inspiration? You may want to watch this presentation by Scott Hanselman: It's Not What You Read, It's What You Ignore. This was presented at a technical conference, and during the first six minutes or so (and at various other times throughout the talk) there may be references that don't make sense out of context, or to a non-technical viewer. But there's still an awful lot of good stuff in here. Dealing with all that stuff we want to read, or feel we need to read to "keep up"
As someone who follows about 200 blogs in my RSS reader, and has too often had the "unread" count in Google Reader show 1000+, I very much related to this: "Take all your news feeds and audit them for noise. 1000+ is no way to live." And, in fact, since watching this presentation, I've unsubscribed from some of those blogs, and I've removed some people from my "follow" list on Twitter. On a related point, Scott speaks about the "Great Obelisk of Shame" — that huge reading pile that you know you'll never get to. For those of us who tend to be information junkies — in paper form, digital form, or both — he suggests we ask ourselves this: "What's the minimum amount I need to know?" Scott says that, in general, "Humans are not supposed to multitask. ... When people multitask, bad things happen." - Walk and chew gum. - Workout and listen to podcasts, or watch TV shows on your iPad. Scott touches on much more: e-mail filters, the Pomodoro Technique, Instapaper for read-later items, etc. But it comes down to this: "What can you throw out, what can you ignore, what can you stop doing in your life?" 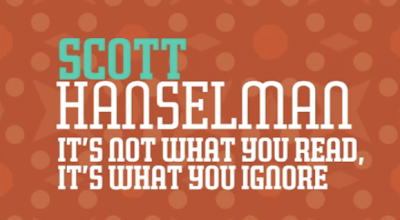 Scott encourages us to throw out anything that's not helping us improve our lives, moving us toward our goals. 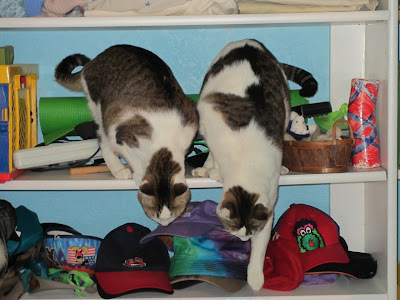 Topsy and Turvy have been kind enough to pose for some photos, as I show you what jewelry designer Stephanie Hamilton has done with her sons' bedroom closet. I've shown you this closet before, but some recent improvements — courtesy of a good handyman — have made the closet even better. 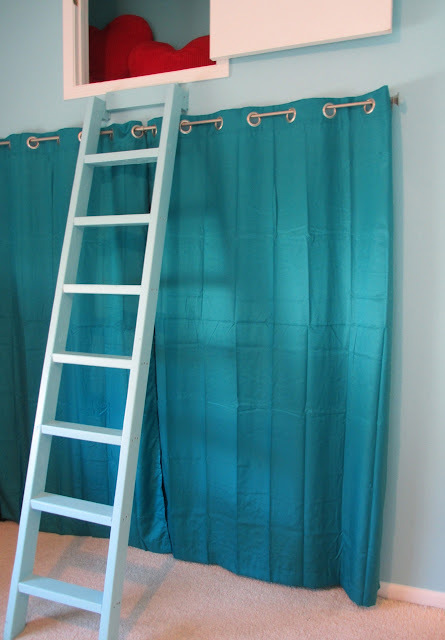 Instead of a closet door, Stephanie has used a curtain — which is much easier to shove aside than the old closet doors were. The curtain adds a lovely splash of color, too. That ladder goes up to what was once a storage area, but now serves as a reading nook. And to make the most of the space, Stephanie has had shelves installed, leaving just one small area with a functional clothes rod. Most of the boys' clothing simply doesn't need to be hung up, and hanging clothes is more complicated than tossing them in a drawer or a basket. And the shelves can hold all sorts of other things, not just clothes. 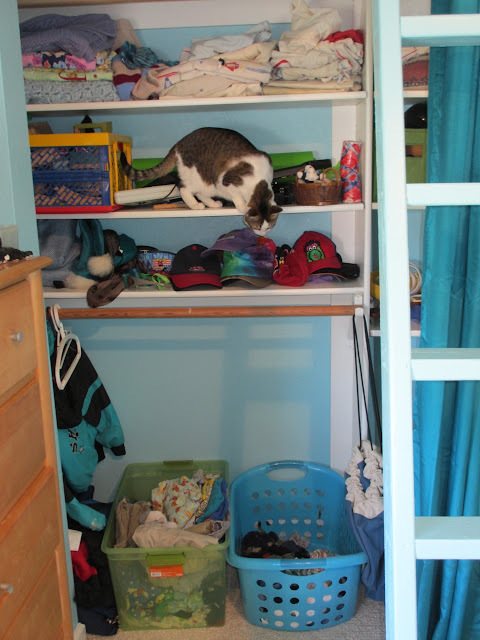 I've done something similar with my guest bedroom closet — kept the clothes rod so I can offer a normal-looking closet to my infrequent house guests, but had shelves installed for storage that better suits my needs when guests aren't around. The shelves are adjustable, and it's easy to remove them (and the items stored on them) when I do have house guests. Thanks to Stephanie for allowing me to take these photos and share them with you! 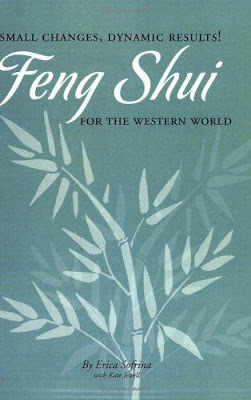 I've long been attracted to feng shui — especially the Western approach, which Sofrina teaches — because it's very much aligned with what organizers try to accomplish. So I enjoyed reading this book, which provided me with a refresher in all the basics, some wonderful stories, and a few "ah-ha" moments. Suddenly I realized that by hanging a lot of parts from the ceiling — the engine cowling, wing parts, etc. — I had all these structures that unconsciously felt like they might fall on my head. After rearranging my workspace I'm now more comfortable working in there, and it's made a dramatic difference. As Sofrina notes, we often store bicycles and other heavy objects overhead — and when we do, we need to be sure our nervous systems feel safe. I found I had four key Guas (areas) intersecting in my garage. The Career area was filled with garbage cans and cat litter boxes, the Helpful People area was loaded with broken things, old furniture, and endless boxes of the "unknown." The Creativity and Children area housed bikes with flat tires and the Center was supposed to house my car but couldn't due to all the clutter. No wonder my life was not moving in any direction I really wanted it to! 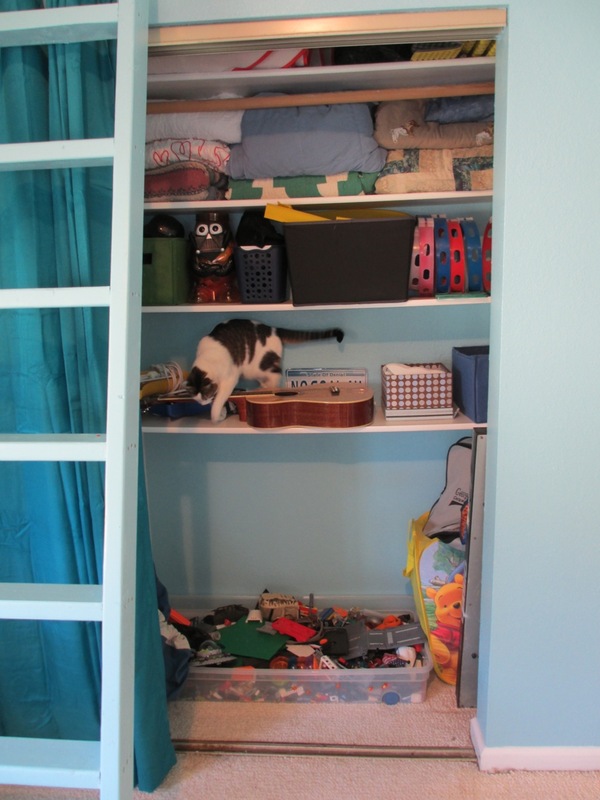 Of course, Sofrina cleared this all up — and then found her life improving in many ways. Sofrina says that feng shui is intuitive; we know when things are out of balance. I find that's frequently true, but it's also nice to have a framework for pinpointing what exactly feels wrong about a space; feng shui can often provide that framework. Does It Stay or Does It Go? What If You're Not Sure? That's my recycling bin, just a few minutes before it got emptied this morning. No, I didn't have a party. I just decided it was time to get rid of the liquor bottles I haven't touched in years, and don't foresee using in the future. 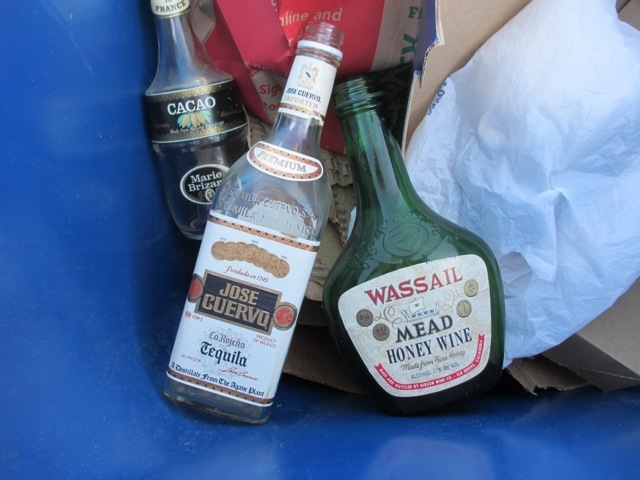 Those are just three of the seven bottles that made it into the bin. I'd thought of doing this before, but I had room for the bottles, so I didn't feel any urgency about it. And I had thoughts like this: "Some recipes call for crème de menthe. Maybe I'll need the bottle for one of those." Not that I actually used one of those recipes. And, of course, there are plenty of other good recipes that don't require crème de menthe. But after reading a feng shui book — more on that tomorrow — I got inspired to finally toss the bottles; they really were just clutter. 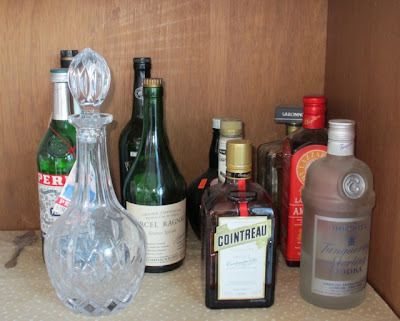 Here's that part of the cabinet now, with just the bottles I really do use; I'm not that much of a hard liquor or liqueur drinker. And yes, I just poured the liquor down the drain. There are probably places I could have donated it, but it wouldn't have been convenient. It's not something I can Freecycle, either; liquor is specifically against the rules. So I went with the easy solution, so I could get the job done. 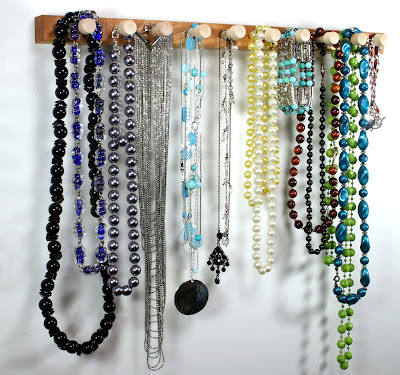 Want to avoid tangles in your necklaces? Like to see them all out on display? 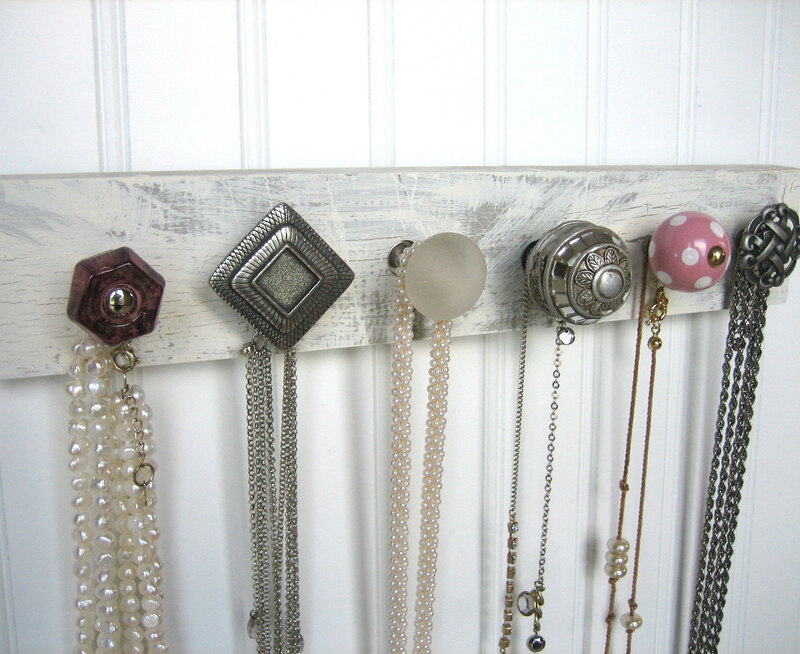 Then a peg rack style of necklace hanger might be just what you want. 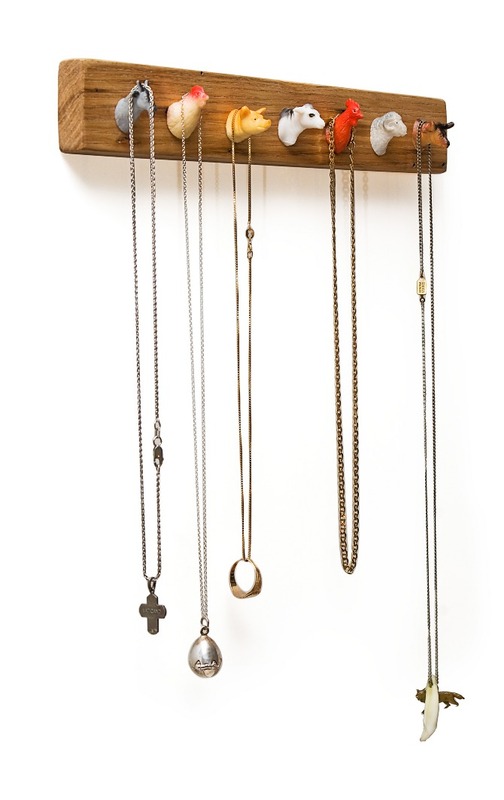 You could go with a traditional wood rack — such as this hanging necklace bar. For something a bit more unusual, there's this necklace rack — made from curly maple and black walnut — from Ken Cayer, The Yankee Woodsmith. 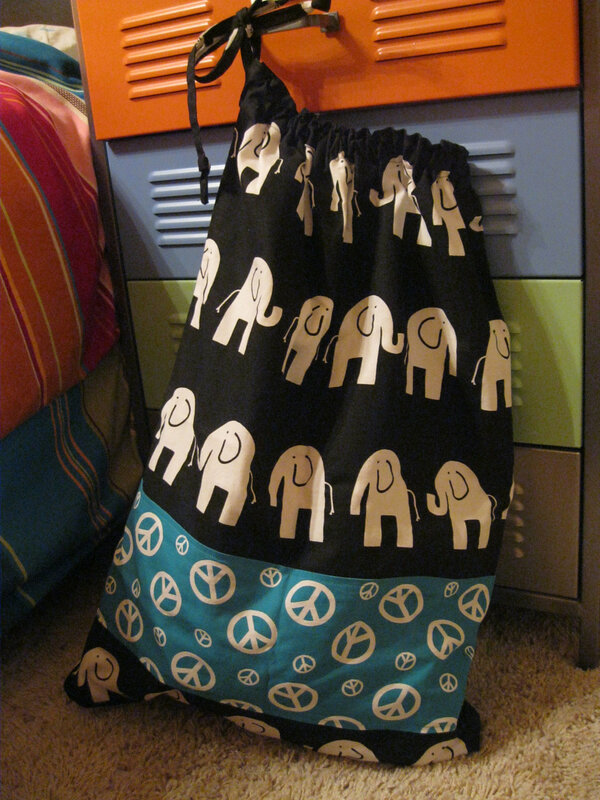 You can buy it on Etsy or on Cayer's own web site. 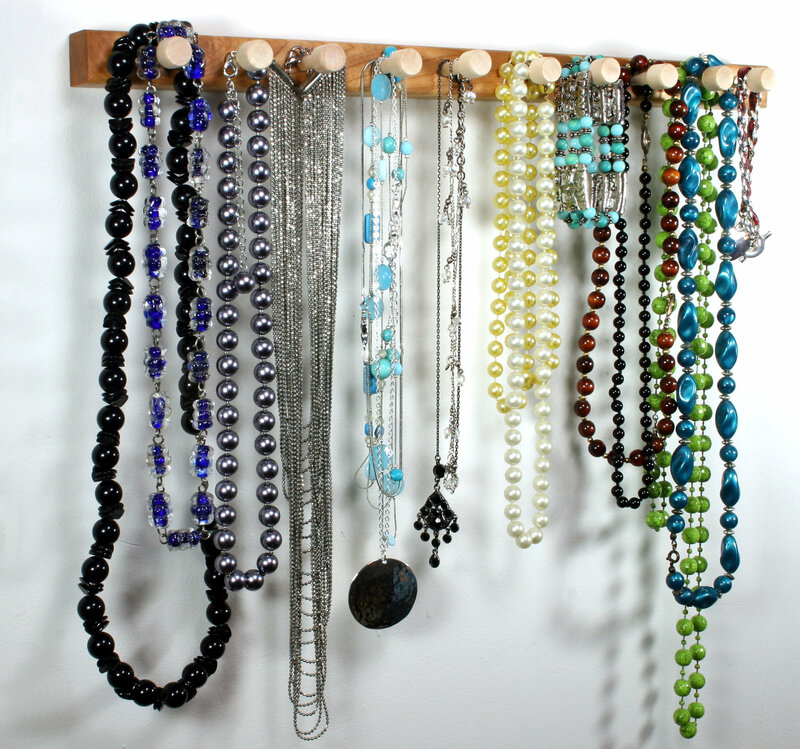 Other places for simple wood necklace racks are The Woods and NHwoodworking. And then there are the multi-tiered necklace holders from Spirit Ranch Creations. 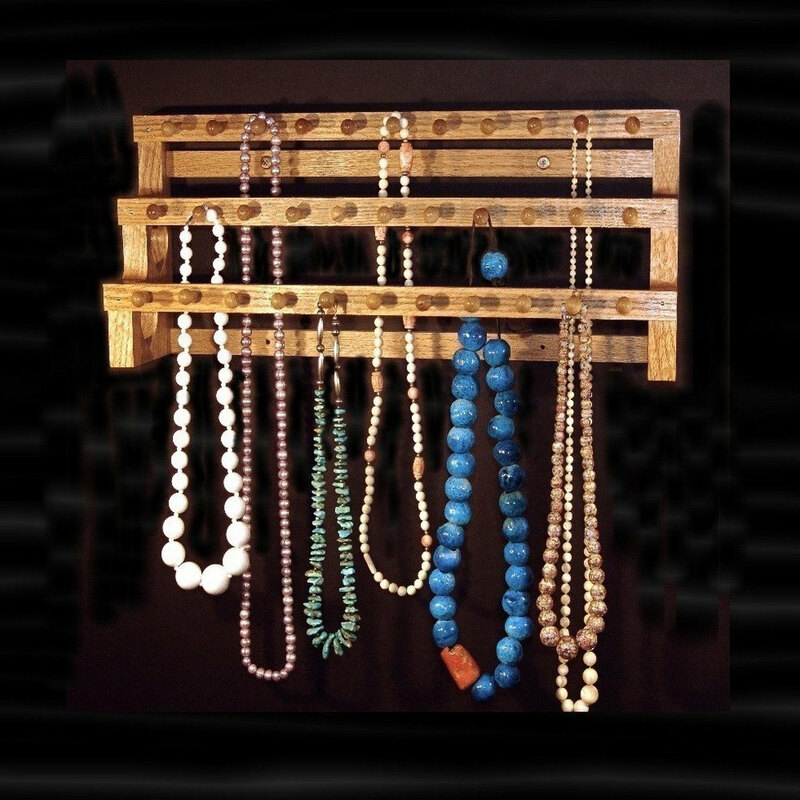 But maybe you'd like something a bit different — like one of the jewelry racks from Aunt Dede's Basement, made with all sorts of knobs. 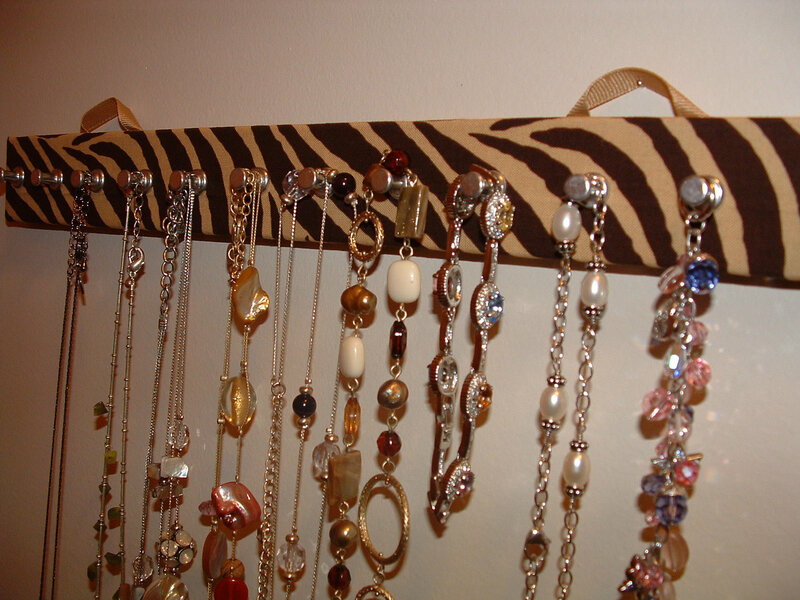 Sarah's Necklace Holders have normal-looking pegs, but patterned boards. And finally, I'd like to show you the whimsical Pack Rack from Steph Mantis; this is the Barnyard Edition, which is my favorite.